Mercedes-Benz USA alleged that it obtained a permit from the city of Detroit to photograph various locations throughout the city. 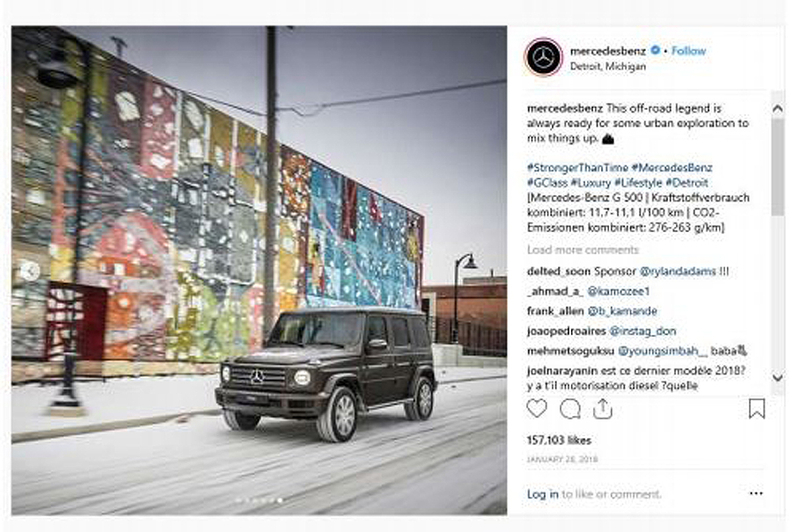 DETROIT -- Mercedes-Benz USA has filed lawsuits against four artists, seeking a federal judge's validation that outdoor Detroit art in Instagram posts didn't infringe on their copyrights. In January 2018, the automaker posted photos of the Mercedes G 500 to its Instagram account, featuring murals and graffiti by street artists in the background, according to court documents. Six photos were shot in Detroit, including some in the Eastern Market, where artists have produced more than 100 murals through a program called Murals in the Market. The lawsuits, filed Friday and first reported by The Detroit News, claim that artists Daniel Bombardier, James Lewis, Jeff Soto and Maxx Gramajo threatened copyright infringement lawsuits against the company last month. Mercedes removed the post from Instagram, the suit says, "as a courtesy." Jeff Gluck, an attorney for the four artists, told Automotive News Tuesday that the lawsuits "dangerously move the needle toward eroding artists' rights and consequently could strip away any protection for so many amazing and important works." Mercedes' spokeswoman Donna Boland told Automotive News Tuesday that the lawsuits were filed to get a resolution of these "baseless threats." Additionally, Daimler, parent company of Mercedes, alleged that proper permits were obtained from the city and copyright laws were followed when using the photographs, she said. Mercedes contends in the lawsuits that it obtained a photography and b-roll permit from the Detroit Film Office that was valid Jan. 15-16, 2018. The four lawsuits, which were filed in U.S. District Court in Detroit, were individually addressed to the defendants. The names of the defendants were the only significant difference among the suits. "The city of Detroit provided people permits to shoot B-roll frequently, however, this is not B-roll. These were photos that specifically had a piece of art in the background of the car. The artist owns the copyright to the art and no one else, not Murals in the Market, Eastern Market Corp., nor the city of Detroit. I have a contract where they licensed a mural the same year from an artist, so they understand the weight and legality of copyright and licensing." Gluck said that if the court agrees with Mercedes, and companies no longer need permission to use and exploit outdoor murals, then maybe artists would hesitate before creating works of art in outdoor spaces. Gluck also said Mercedes did not obtain the proper clearance to use the murals. "The location permits issued by the city did not include the right to use the artists' work," he said. "It is disingenuous for Mercedes to claim otherwise and this is nothing more than a thinly veiled attempt to intimidate and bully." Gluck also said the defendants were in the middle of having ongoing discussions with Mercedes about the allegations that their work was being used in the advertisements. He said the artists had asked Mercedes for more information and while the artists were waiting for the automaker the respond, Mercedes filed the lawsuits against them without any forewarning. It wasn't until The Detroit News called asking for a request for comment Monday morning that they found out, he said. "All of the people involved in these advertisements--the photographer, the location scout, the person driving the Mercedes G 500, the ad agency, etc., presumably have all been paid for their work, except for the artists who made the main creative element of these ads," he said. Detroit Mayor Mike Duggan's office said in a statement: "The city of Detroit's standard b-roll permit approval speaks only to filming, not to usage. Letters issued to permit holders clearly state that the recipient must meet the necessary trademark and licensing regulations required for usage by all private-party entities. We support the rights of our local and visiting artists in this regard." This isn't the first time an automaker has battled with an artist -- or Gluck -- over copyright infringement on outdoor art in Detroit. Artist Adrian Falkner, known by the pseudonym Smash 137, filed a lawsuit last year against General Motors, accusing the automaker of using one of his outdoor murals in a marketing campaign for the Cadillac XT5 crossover without his knowledge. The suit, filed through the U.S. District Court in California, claimed that GM intentionally concealed Falkner's signature by taking the photograph from an angle that made it not visible. The mural, painted in 2014, was designed to showcase the artwork of a project called Z Garage in Detroit. GM reached a settlement with Falkner in February, according to a court filing. Each party decided to bear its own attorney fees and costs. Gluck represented Falkner in the case. He declined comment on the setttlement.